Products Tubular Solenoid Series | TDS Co., Ltd.
Products　Tubular Solenoids | TDS Co., LTD.
TDS-PL1302 --- Pull type, York DIA 13mm. TDS-PS2501 --- Push type York DIA 25mm. 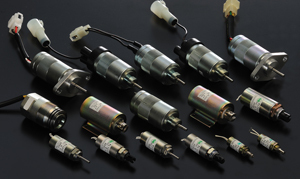 TDS's tubular solenoids come in two basic types, namely, the pull-type and push-type. Both are designed to offer the same funstional characteristics. Energized, the plunger is stopped at the end,preventing a collision with the fixed core, smaller imapact noise and absence of residual magnetism. * With standard radiating plate.